The white colonial house with black shutters at 159 Kings Highway North was built in 2003 but could easily be mistaken for new construction. WESTPORT — Able Construction put a new spin on an “old” classic when the team built the colonial house at 159 Kings Highway North for a well-loved figure in the local community. The white clapboard house with black shutters was only built in 2003, for Rabbi Yehudah Leib Kantor of Chabad Lubavitch of Westport, and his growing family, but most people would guess this is a newly constructed home. It has 10 spacious rooms in 4,752 square feet of living space on four finished levels, with nine-foot ceilings throughout most of the house. The open living spaces “are complimented by huge windows and a surprising feeling of serenity in this unbeatable walk-to-town location,” according to the listing agent. This really is a convenient location. 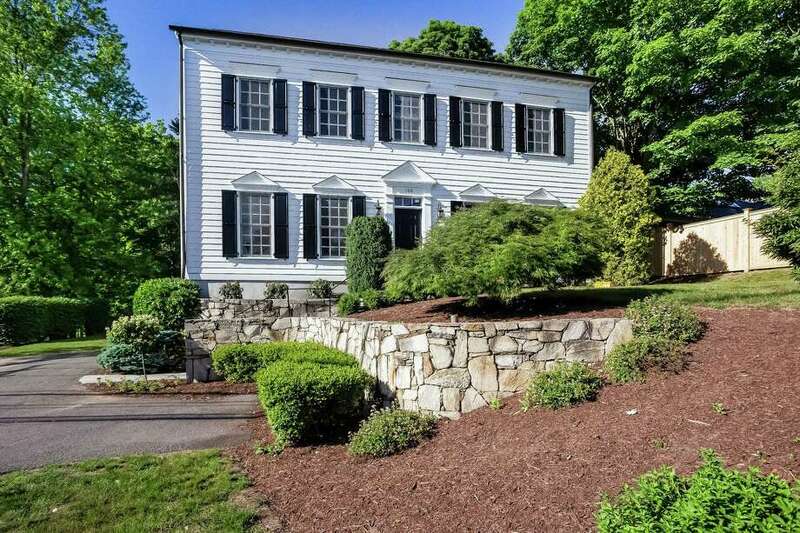 The house sits on a 0.23-acre property that is within easy walking distance of downtown shops, restaurants, and municipal amenities including Town Hall, the Westport Historical Society, the public library, the Levitt Pavilion, and the Westport Country Playhouse. It is also about equidistant to the Merritt Parkway and I-95, and only minutes from the Saugatuck train station. Another of its many attractions is the sizable driveway, which provides ample off-street parking; a plus for an in-town location. It is also a rather private location considering its proximity to some local businesses and downtown Westport. The backyard is fenced and the privacy is further enhanced by the border of trees. To access the house climb the stone and slate stairs to the front entrance, which is topped with a transom. Inside, the formal living room has wainscoting on the lower walls and is open to the great room, which, in turn, is open to the dining room, where there are two sets of French doors. One set leads to the patio and backyard. The other accesses the breakfast nook and the gourmet kitchen. In the breakfast nook there are sliding doors to the same patio. Like the living room, the great room and dining room are also framed by wainscoting, stylish crown molding, and all have nine-over-nine, double-hung windows that bring in abundant amounts of natural light. In the kitchen the features include a center island, granite counters, and high-end stainless appliances. Between the kitchen and the living room there is a half bath, which can be accessed from either room. The second floor contains a large sitting room, the laundry room, and three of the home’s five bedrooms including the master suite, which has a walk-in closet and a full bath with a double vanity and large glass shower. The other bedrooms share a hall bath, which also has a double vanity. On the third floor there are two more bedrooms and a hall bath. All five bedrooms have wall-to-wall carpeting. In the finished walk-out lower level there is paneling on the lower walls and a sizable space to be used in multiple ways. The space can accommodate more than one function and could be a media room, a game room, play room or an exercise room. This level also has a full bath so there is potential to create an au pair or in-law suite. Outside, a wide slate path leads from the front yard to the back patio and yard. For more information or to set up an appointment to see the house contact Kim Harizman of KMS Partners/Coldwell Banker Residential Brokerage at 917-270-5168 or kimharizman@me.com.